There are Currently No Coconut Grove Hotels Available. 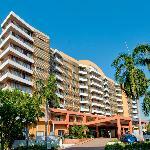 Click Here to view a list of Coconut Grove Apartments Available. Hotel facilities include a delightful guest swimming pool with BBQ facilities, FREE off-street parking, wheelchair accessibility and a lift to all levels.There are vending machines for that late night or early morning snack or beverage, conveniently located in the lobby, as is the public phone. For guest convenience a microwave, iron and ironing boards are available on the first and second floors. The friendly staff will be more than happy to care for all your tour needs. Relax, kick back and let them find the best deals for you. See you soon at Value Inn "Where a good night in Darwin City costs less".